Migration will play a central role in the June EU referendum. Which arguments, facts, and strategies will the campaigns deploy to swing the vote in their favour? 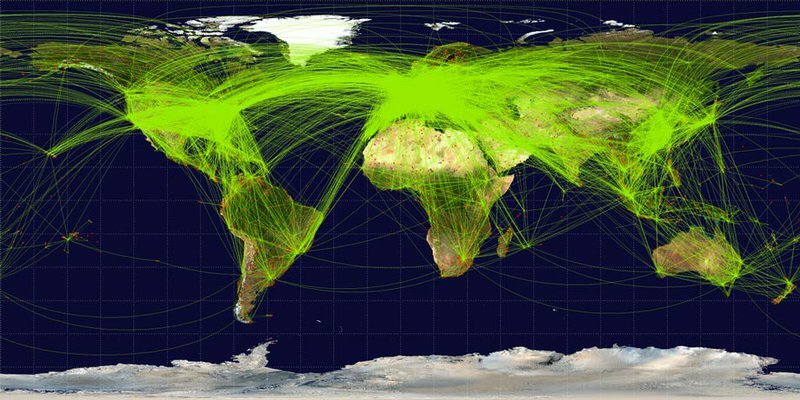 Map of scheduled airline traffic around the world in 2009, with 54,317 routes. Jpatokal/Wikimedia Commons. Migration has emerged as perhaps the most prominent – and certainly challenging – issue for both the In and Out campaigns on British EU membership. The British prime minister David Cameron himself made it such, when he included it as a central demand in his renegotiation of Britain’s terms of membership. That he did so was surely political expedience: as YouGov polls confirm time and again, immigration is considered the most important problem facing the country right now. Indeed, greater control of borders and limiting benefits for migrants topped people’s wish list of changes to be negotiated by a wide margin. Some thus say migration is the issue that will determine the outcome of the referendum. Others are more sceptical, pointing out that migration is the key factor determining voting intentions only for those who already have fixed their intentions, or who always would have voted either for or against leaving the EU. In fact though, the vote is likely to be lost or won over the ground of the as yet undecided voters, which hovers around an astonishing 20% of the population. Will they take less Manichean views on migration? How likely are they to link control over immigration with EU membership? Migration by its nature has an impact – both positive and negative – on labour markets, welfare systems, demographics, and security. That it thus hits very close to home for many voters – whether or not they have direct experience of migration – makes it an obvious topic for campaigns. Yet, of course the devil is in the detail. A wide range of data is publicly available, some from rigorously researched sources and some from less so. Migration as a topic has lent itself particularly easily to the (mis)appropriation of figures, to hypotheticals and counterfactuals. Would Brexit make the UK more or less able to control who comes to live here? Would reducing migrant numbers come at the price of reduced access to the EU market, and if so, which matters more? What about the refugee crisis? Who is particularly likely to vote on grounds of immigration concerns, and why? As we did last time, in this second week of the Brexit Divisions project we bring together commentators, expert analysts, campaigners and other opinion shapers to explore this topic in depth. They not only aim to inject factual clarity and critical analysis into the debate on migration, including freedom of movement and the current refugee crisis. They also explore how these issues are being instrumentalised to various ends in the battle over people’s hearts and minds in the run-up to the EU referendum. Facts and figures, and even the most intelligent or well-supported claims about them, may after all not be what sways the vote in this referendum. More intractable aspects of British identity, competing visions of national sovereignty and citizenship in a globalised world, and anxieties about the pace of change will end up playing significant roles. To this end, the articles have looked at the effects of EU migration on the UK and their role in the two campaign camps; the actual everyday experiences that result from migration and the perspectives of migrants who have made Britain their home; as well as health and security considerations. We hope they serve to stimulate discussion, and to provide both complex and accessible food for thought. The freedom of movement of labour is at the core of arguments over Brexit. Ian Preston looks beyond the questions of whether getting rid of free movement would give Britain more control over immigration, and of whether or not free market access is to be had without it. Instead, he asks if it would be economically beneficial for Britain to disengage from the free movement of labour within Europe. He scrutinises the economic advantages that free movement rights imply for different groups and different interests. What might they gain, respectively? And what really are the implications of EU migration for the exchequer? A confident UK, he concludes, has nothing to fear from the free movement of labour. Yet public attitudes on the issue of immigration, Stephen Booth reminds us, are "more complicated and nuanced than we often imagine". In his article, he forecasts that the vote will not be decided by the noisiest Leavers or migration adversaries. Rather, it will be the large swathe of voters, who are sceptical of the EU and anxious about immigration yet are capable of weighing up the balances of risks, who will cast the crucial votes. The referendum campaigns, Booth predicts, will be fought largely over people’s perceptions of these risks. While there is no denying that free movement does mean a certain “loss of control” for Britain, Booth argues that this applies to all migration, irrespective of EU membership, and that non-EU net migration to the UK remains higher than EU migration. Hugo Dixon offers a declaredly partisan plea that Britain benefits from the free movement of EU citizens across the member-states. He argues that Eurosceptics’ misgivings about free movement, while containing a grain of truth, are exaggerated, and considers possible retorts to them. He cites both the recent Labour and Conservative governments’ poor record in predicting the levels of EU migration as a reason why free movement is such a hot topic. UKIP, Dixon continues, has exploited the resulting lack of credibility of politicians in their line that the only way to control migration is to leave the EU. “Ask most people to describe how the EU affects them and the issues of free movement and immigration are those most likely to come up”. Steve Ballinger explores what kinds of arguments on either side are most likely to be plausible to British voters. What would the EU look like if Britain left or stayed – and what would immigration be like in either scenario? Remain cannot afford to duck addressing this question. Ballinger argues that they need to concede that continued membership would mean no significant reduction in numbers of EU migrants and focus on the argument that this is “a price worth paying for being part of the club”. The challenge for Leave will be to come up with a real-world plan for a post-Brexit immigration policy. Would the most important priority be reducing migrant numbers, or continued access to free trade? What would happen to EU citizens already living here? Would leaving mean prioritising non-EU over EU migration, and what are the reputational aspirations of some Leave campaigners behind such promises? What is needed in any case, Ballinger says, is greater public engagement in the migration debate – including a realistic revision of net migration targets. Damian Green MP gives us another perspective from the In campaign. He critically engages with arguments that Brexit would enable the UK to reduce migration and restore control over its borders. He refutes the suggestion that a UK outside the EU would have control over migrant numbers, given that access to the single market will necessarily entail accepting free movement. Britain’s control over her borders, secondly, would be endangered rather than restored by leaving the EU, not least because leaving would threaten the bilateral agreement with France whereby many asylum seekers are stopped on French soil before entering Britain. Finally, Green calls for “fairness in our immigration system, not a free for all”. He notes that the overwhelming majority of EU citizens are “contributors, not freeloaders”, and defends David Cameron’s settlement on migrant benefits as a “breakthrough agreement”. Steven Woolfe MEP, UKIP spokesman for migration and financial affairs, represents the other side of the divide. In his contribution, migration is a key reason why the British people will – or should – vote for Brexit. EU citizens’ right to migrate to the UK, Woolfe argues, harbours two main problems. On the one hand, EU migration represents an economic burden for the country; one felt in particular on the UK’s housing sector, public services and labour market. On the other, immigration threatens Britain with long-term demographic changes. This, he posits, would ultimately change the nation’s “destiny”. Critiquing in particular the government’s “unrealistic” target for net migration, Woolfe thus calls for a Leave vote in order “to take back control of Britain’s borders”. Catherine Barnard and Amy Ludlow discuss the perspective of EU migrants coming to the UK, their rationale for migrating and staying, and their everyday experiences. With the political and media focus tending to fall on ‘benefit tourism’ and the abuse of free movement, research confirming that EU migrants contribute more to the economy than they take out in benefits is often given short shrift. However, it may be precisely because the welfare system is not the primary motivation for EU migration to the UK that the prime minister’s deal on migration – the ‘emergency brake’ and the indexing of child benefit sent abroad – is widely expected not to have much of an effect. As Barnard and Ludlow detail in this piece, their interviews with EU nationals in the UK confirm this, as their interviewees almost exclusively describe professional and personal development (including language acquisition) as the main factors driving EU nationals to the UK. In reflecting upon the views that Polish citizens resident in the UK hold on a potential ‘Brexit’, Anne White draws on both qualitative research and personal anecdotal evidence. In the 12 years since the accession of central and eastern European countries in the 2004 ‘big bang’ enlargement, she finds, many individual lives were planned on the assumption that free movement was not a right at risk of being retracted. The piece paints a picture of a whole generation of Poles now at home in the UK, raising families, entering jobs, creating networks and participating in leisure activities within their communities and outside them. For many of those – some of them ‘double return migrants’ now back in the UK, some of them even British citizens – the unpredictability of the referendum’s consequences creates significant uncertainty. Eva Hoffman adds another dimension to the picture: the ‘psycho-geography’ of what European free movement has done to the internal individual experience of migration. The author of Lost in Translation compares the Europe of free movement to the divided world of the cold war era. Then, emigration from eastern Europe created a sharp sense of rupture: between the past and present, between one’s original and new identity, between ideas of home and displacement. Today’s new European migrations take place with the ever-present possibility of return, or back-and-forth travel. This creates a very different internal geography – often, a state of suspended ambivalence, or what literary critic James Wood called “homelessness.” While free movement is one of the boons of post-1989 democracies, the new migrations are not without their consequences. In our globalised world, the weight and the shaping force of history and national identities may be lessening; but this may also lessen the force of particular attachments, and of wider social solidarity. Rita Hordósy and Matt Wood ask how ‘soft security’, that is the protections around everyday aspects of life such as air travel, medical provision, or gastronomy, matter in the referendum debate. The Brexit debate invokes security closely in connection with concerns about immigration and an explicit link to the danger of a terrorist attack. Research shows, however, that such a link is very difficult to specify. By contrast, much of the EU’s regulatory tasks, setting standards for services from education and medicines to food quality and air travel, provide a perspective on security that does not make open borders an inherent ‘risk’. Instead, it is an opportunity to make us all safer when living as well as travelling across the continent. In or out of the EU, this ‘soft security’ agenda will remain important for long-term economic and social stability. John Martin approaches the matter from two points of view: as a scientist and doctor, and as a moral person concerned about political development. If new treatments for heart disease, brain disease, or cancer are to be found, he warns, then teams are necessary. Paying homage to the creativity that arises from the multi-national teams of young scientists who staff his laboratory, he argues that access to a Europe-wide pool of the best and brightest remains crucial. Brexit, he fears, would not only make it significantly more difficult to attract the best talent. It would also re-erect barriers to collaboration with European peers, which has become highly beneficial to clinical science in the UK. It would also, he argues, have adverse implications for the material and financial value of a UK economy based at least in part on scientific creativity. Damian Chalmers closes this guest week by placing the role that migration plays in the Brexit debate in a much wider context. The original aspiration of the doomed “EU constitution”, later transformed into the Lisbon treaty was to create conditions for a postnational community where individuals were to be as comfortable being and living alongside EU citizens as they were alongside national citizens. Migration, he suggests, has become a touchstone for the dissolution of this dream. This is, Chalmers argues, because Europe’s leaders focused on the wrong question. Instead of aiming to make EU decision-making more democratic, they should have sought what Chalmers calls ‘democratic authority’. This would have addressed three separate debates, which he goes on to explore in more detail: the nature of what the EU does (placing core activities under domestic political contestation); relative democratic authority (ensuring no trespassing of national legal systems and procedures); and an ethos of EU citizenship (reassessing national citizenship and binding EU citizenship to opportunity and integration). Without such reforms, he posits, the EU’s problems will remain with or without the British.